BULIMBA’S Catholic community were one of the last groups of Christians to receive an official spiritual home. The local Catholics had to wait almost 54 years after the free settlement of Moreton Bay to get to Mass without making a trip down the river. They eventually bargained a meeting with Brisbane Archbishop Robert Dunne in 1896 to receive a local church, and in December that year their prayers were answered. 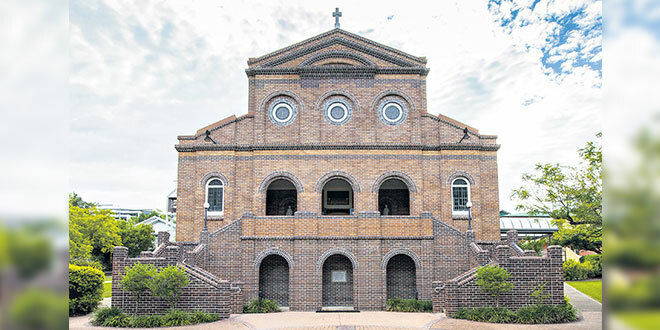 Archbishop Dunne named the church after the faith’s most venerable martyrs, Sts Peter and Paul, and denounced popular belief that the new sacred building was “too good” for the Bulimba district. “Anything given over to God could not be too good,” Archbishop Dunne said to the congregation on December 6, 1896. A string of priests served the Bulimba community, most notably the “apostle of Brisbane”, St Stephen’s Cathedral architect Fr Joseph Canali. In 1916 the community received its first parish priest and was canonically recognised as a parish, taking on the name of its first church’s patrons. A new brick church was built in 1926 and still remains today, while the original wooden church was demolished in the 1960s for being “prohibitive”. During its 100 years of life, the parish have welcomed Religious Sisters, lived through horrors of the Second World War, received scores of school students, embraced liturgical changes and most recently, structural changes in 2015. Parish priest Fr Tom Elich said throughout its entire century of existence, the parish “has tried to be a sign of God’s kingdom on earth”. The centenary celebrations will continue for the rest of the year, with a gala ball scheduled for July 30 at Victoria Park. Other events include a benefit for Good Samaritan education in Kiribati between August and September and concluding with a fundraiser on Melbourne Cup Day, and a Mass for deceased parishioners on All Souls Days, November 2. The centenary will conclude with a blessing of the centenary monument on November 20.